Greetings and salutations, everyone; yes, once again it is I, Mani the purebred border collie, filling in for the guy I live with, and here to bring you the latest news from our garden. You may remember me from such posts as “The Hose, You Know”, among so many, many others. Here I am in a characteristic pose. Believe it or not, a couple of nights ago it rained. And not just rained, but really rained. We got over an inch (two and a half centimeters) of rain. The guy I live with made a bunch of rain movies, and then accidentally deleted them. Partly because he used a new program to fiddle with the movies in the first place (a program which was on the laptop when he bought it but never knew it was there), and partly because, well, you know, he just deleted them. “Like you sometimes do”, he said, though I never delete anything, unless it’s something which might implicate me in some kind of naughtiness. He spent some time working with a program which restores deleted files on the card, but then decided the heck with it. He often decides that. I guess you’ll just have to imagine the rain movies, though I do have some things which might help with that, like a much shorter movie. It does sometimes rain here, at this time of year. People who live here like to talk about the monsoon, which actually takes place a couple of thousand miles to the south, and where they have plants adapted to flower at this time of year because of the rains, but the guy I live with said he didn’t feel like arm-wrestling anyone over whether or not you could call rain at this time of the year “the monsoon” because it seems to make people happy to call it that. “Even though …”, well, never mind, huh. Not a whole lot has been happening here because of the monsoon. I decided to type that even though the guy I live with would start in on how Colorado, etc. Some plants have been purchased, which I know comes as a terrific shock, there are actually new plants here, and they haven’t been planted. In this picture, not so many, just the plants in the flat right there. All the plants in the flat, here, in the picture below, and the two Artemisia stelleriana. (Talk about being overexposed.) Same Steller as Steller’s jay, according to the guy I live with. I’ve never seen a Steller’s jay but I hear we have them, in the mountains. We might go camping sometime, and see one, but just between you and me, camping sounds fairly scary. No Pottery Barn sheets to sleep on, on a rainy afternoon. And my forts just got refitted with new rugs which are very nice. Anyway …. The thing here that’s, well, the guy I live with wants to call it revolutionary, but it’s really just something that practically anyone who’s ever seen a plant has done, at least once, but what’s going on here (since I’m supposed to say, and you get to decide whether or not it’s totally revolutionary or just a complete embarrassment, as usual), is that instead of planting everything by washing off the peat moss and stuff, the roots have been teased out and all the plants have been repotted in a size larger pot, so that hopefully the roots will start growing out of the root balls, instead of just sitting there, and the plants can be planted maybe later next month. The potting mix, if you needed to know, is mostly just sand and perlite, with a tiny amount of peat moss. And it’s supposed to rain more. 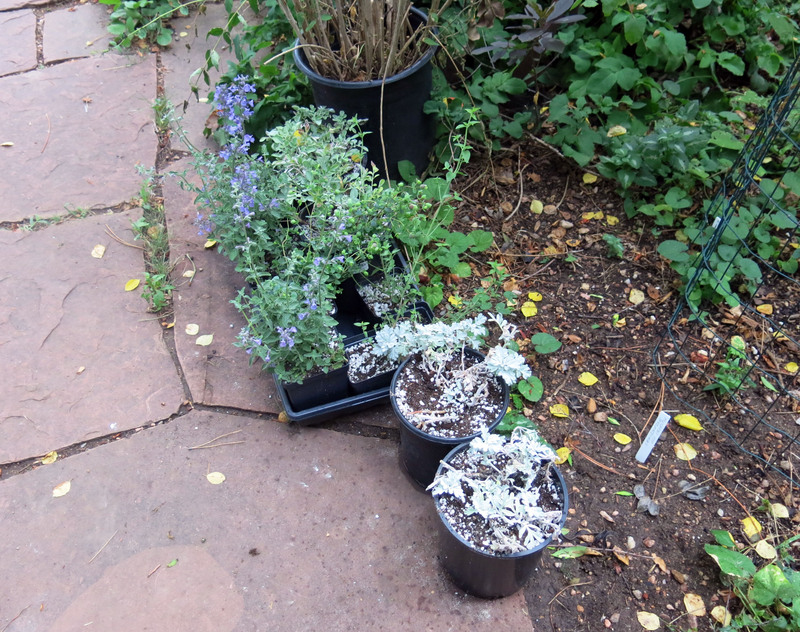 I guess technically the plants would be happier planted in the ground, if it rained a lot, but someone tends to forget about newly-planted plants, thanks to a wandering mind, or something, so really, the plants are safer growing here right next to the patio. I mean if they were planted, and then it rained almost every day for a month, maybe that would be okay, but the guy I live with decided not to take any chances. So that’s it for today. I’ll leave you with with a picture of me in my fort, not scared or anything, just relaxing, though I do think this does look a bit noirish, like I could be Sydney Greenstreet, in the back room of a bar, maybe at the edge of town in some remote part of the world, and the air is all electric with the coming of the monsoon. Tell TGYLW I don’t know if his new planting technique is revolutionary but it is easier to keep those new plants watered. it sounds like they will adjust more easily when he puts them in the soil but won’t he need to water as much when he finally plants them? Ask him if I understand correctly that he does not take off all the old potting soil anymore but just teases the roots out to help them go into the sand/perlite mix. Maybe this new technique does not stress the plant as much. That’s exactly what’s happening here; hopefully the roots will grow out to fill the new pot, or least make some effort. Some of the root balls were so tight it seemed impossible to do anything with them but replant them, and I, for one, can guarantee that anything planted now will probably be ignored until, oh, next March. Even with the little flags he puts out. Nothing is done to the roots except a little teasing. Sometimes, with roots, you can’t even do that. The plants will probably need as much water when planted but they’ll have more roots which can take up water instead of just being packed in like sardines. 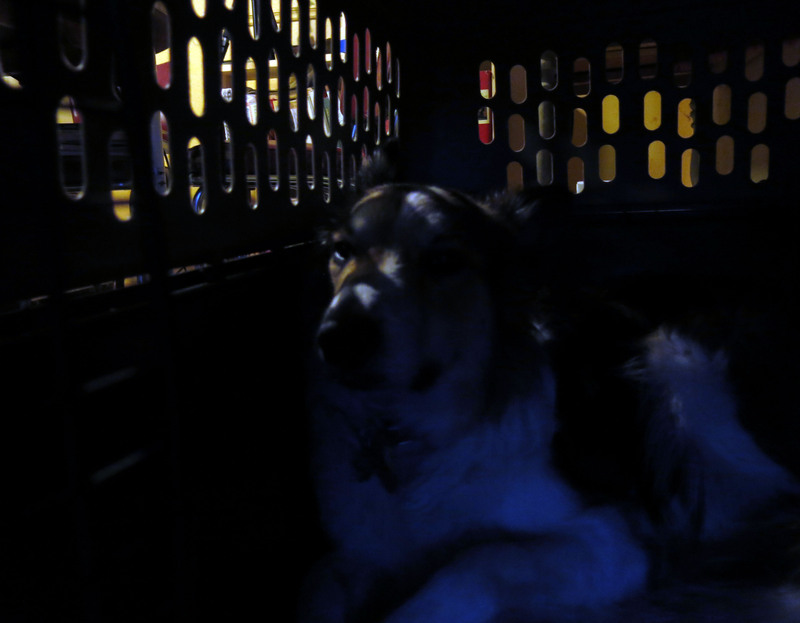 (We purebred border collies like sardines, if you didn’t know.) It’s very difficult to get the center of tightly-packed root balls wet, as you know, and so those roots aren’t even contributing to plant growth. Of course the guy I live with forgot to patent this method. Ah ha! No patent! 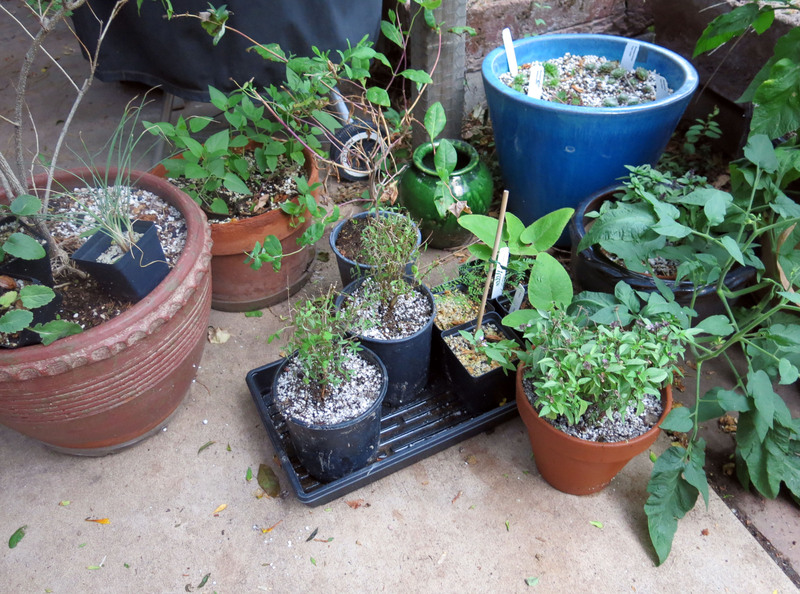 Then I can see if this method works for me although I don’t have the same soil as you all so I guess I will have to come up with my own new potting mix – maybe just mix in some lovely soil that the gophers shove out. By the way, Mani, I’m guessing my blue heelers (dogs that is, not my heels) would also like sardines. The basic idea is just to get the roots growing outward and downward (downward being best), so sand and perlite is practically perfect. Just bagged sand that came from a box store. And perlite. And a tiny amount of peat moss. (The peat moss in the bag, in the shed, is rock hard and could probably never be fully wetted again, unless left out during the winter, so the guy said the heck with peat moss, too. Which he dislikes anyway.) With sand and perlite you can water the pots a lot, and not worry about driving out the oxygen. I’ve never had sardines but I’ve heard stories. Like when Slipper was really sick he got sardine juice drizzled on his regular food; things like that. Sardines turn out to be kind of like salmon, but smaller. Thanks Mani for relaying this information. Bagged sand and perlite I do have, but like you I don’t have sardines, or even salmon. Wild caught tuna in a can is the best I can do. You’re welcome. I think I did get a can of Taste of the Wild with salmon, for later. Well, the guy I live with is going to tell a story about roses, eventually. Not a happy story. But it involved giving some away, and making sure the roots had no soil around them, because of The Beetle. Apparently it’s been raining all around us. Kind of like that scene in Blair Witch where there’s that noise all around them. (I couldn’t watch all of that movie, and I think it’s turned me off camping for a while.) If it does rain here, as in a downpour, we’ll probably get it on tape. That rain looks and sounds wonderful. It was pretty nice, and sometimes doesn’t come with a whole lot of thunder. But that turned out to me not much rain, again. The big rain, last Wednesday night, really did soak the garden. Previous post: Yay, I remember that voice from a movie from way back in this blog. Great to hear it again. Garden is fascinating. Thanks. We thought it might be funny. It *was* funny. I called scads of folk in to listen and look. We didn’t come across that accent in Vienna, Slovenia or Croatia. Or even in Trieste, Italy. We figure it must be native to a high, dry garden. Lol, huh. I was going to say more, but, I guess lol is good enough. Monsooner or later, heh heh. Finally watched the film, so tranquil and soothing. No wind? Almost disquieting. Film deleted itself when I tried to watch earlier. No wind. And you can watch in High Definition. I hear we pay extra for being able to show movies, and maybe you’ve noticed there have been long stretches with no movies, and then someone says “We pay extra to be able to show movies” and so there are movies, again. Hi Mani, Sampson the doberman, here. I liked your rain movie. It’s been really dry and hot here. Everyone is cranky. The lady I live with decided to shoot me with the hose whenever I barked today, which I thought was totally unnecessary. 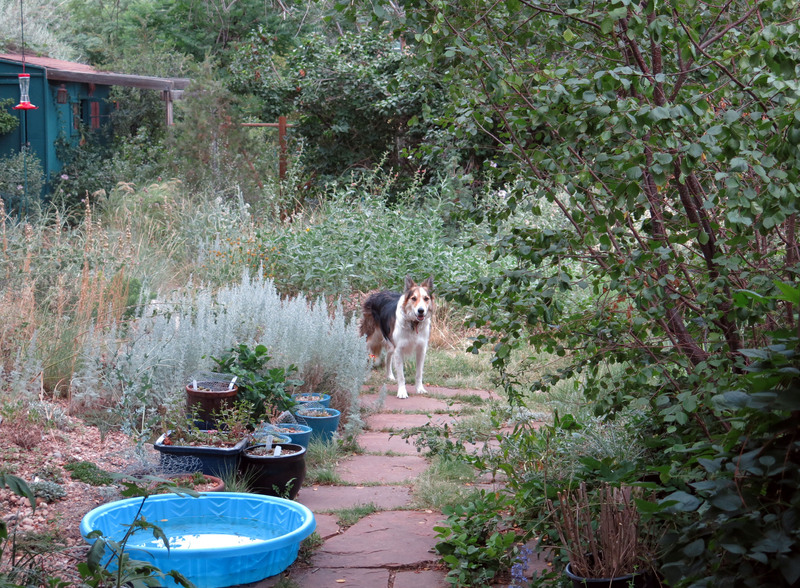 She has been hosing down plants all week and has been complaining that it’s too hot to weed. We have some new, fancy lilies this year and delphiniums which grew from seeds. They all have tomato cages around them. I think that’s to make me feel bad about trampling the elephant ears last year. Whatever. Nice fort! I have a dirt wallow by the fence under the epic clematis armandii. It’s also noir. Well, dappled shade, anyway. Thanks. I have two forts, actually. The Main, or Kitchen Fort, and the Upstairs, or Bedroom Fort. Like Chess, the purebred border collie who lived here before me, I was trained early on to utilize my fort in the best ways possible, like if things got scary, or to take naps in. I sometimes get water tossed at me, from a dish, when I bark at squirrels “too early” in the morning. Though there’s also a heavy-duty spray bottle which can squirt water clear across the yard. We got a whole inch of rain last week, which was really excellent, but the weeds here were set back considerably by the lack of rain in the several weeks before that. It’s funny that the cages here don’t really make me feel bad about smashing stuff, in pursuit of tree-dwelling rodents, at all.